Create a more custom look by matching your Hager door hinges to the door knobs, handlesets, or lever handles that you choose for your new home. 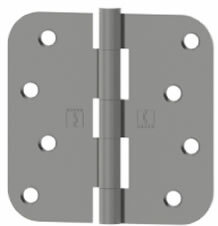 Hager door hinges are sold each. 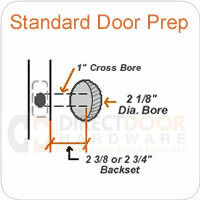 If you have a door that has three hinges, you will need to order QTY 3. I repainted our screened in back porch. The original hinges on the French doors were all corroded. These were a perfect replacement at a great price. Used the Hager 4” hinges to replace original door hinges on 6 French doors opening out to our Lanai that had rusted over time due to the salt air and humidity here in FL. Installation was easy with all necessary screws included. During installation I did remove the hinge pins and applied some lithium grease to prolong their usage. Original hinges had been in place for 18 years so I am hopeful that they will last at least as long. Looks great, installed very easily, no concerns. Thanks for sending to us so quickly. Do these come with non removeable pins and how do I know if I need heavy duty or not. Door is a solid wood door, 8ft tall?